This article was originally published by us on September 22, 2009. In light of Afra Raymond’s excellent article published by BFP on March 1, 2010 CL Financial & CLICO Bailout – The Mystery of the Missing Billions we thought our readers might want to give further consideration to the conflicts of interest by Barbados Prime Minister Thompson in relation to the CLICO scandal and bailout. We’ll repost this article at the top of the blog for a day or two. The Prime Minister of Barbados has a long-standing conflict of interest between his duty to the public and his close friendship with CLICO Barbados executive Leroy Parris. Mr. Thompson has addressed the conflict essentially by saying that Parris is his longtime friend and anyone who has a problem with that can pound salt. In other words, the public can “piss off”. Sorry about the language friends, but I wanted you to be clear on the Prime Minister’s simple message when the fancy words are stripped away. Make no mistake, Barbados citizens have been told to “piss off” when it comes to mentioning David Thompson’s conflict of interest. Thompson used to be CLICO’s lawyer – at a time when the company illegally failed to file financial statements! … However, reports this week indicated that forensic investigator Bob Lindquist has uncovered a dummy company associated with CL Financial and Clico. The company is said to be linked to two former senior officials of CL Financial. Lindquist has been called in by Government to assist in untangling the maze of dealings in the CL Financial group in the wake of a State bailout of the conglomerate. Sources said Lindquist has uncovered a paper trail showing the exchange of funds between the various companies of the group. This paper trail suddenly came to an end after detailing the transfer of funds. The phantom payments were reportedly made under the guise of “consultancy fees” and cannot now be traced. So much for the claim that Barbados has effective oversight and regulation of public companies and the insurance industry. 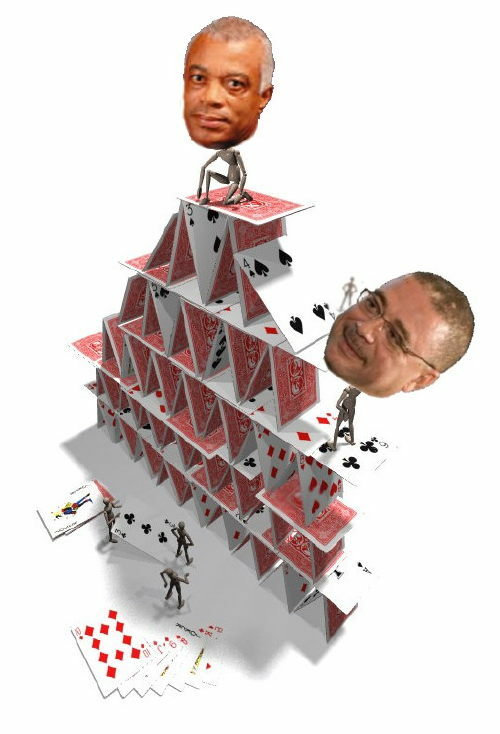 The house of cards known as CLICO has fallen and it turns out that CLICO’s criminal activities were known and documented by the Government of Trinidad & Tobago as far back as 2006. Meanwhile, the current forensic investigation by Bob Lindquist has apparently uncovered dummy companies, monies being transferred to nowhere and the ever-present “consultant fees” by the truckload. A CL Financial company called British American Insurance Company Limited is being sued over a US$300 million dollar Florida land deal. A court document obtained by Barbados Free Press alleges that secret “incentives” (read “secret commissions”, “bribes” or “gifts”) were provided to company insiders in return for having CL Financial Group purchase the land for more than it was worth. Barbados Free Press today discovered that a Senior CL Financial Executive named Robert FULLERTON formed a new Florida company B. A. Payment Services LLC on February 5, 2009 after all the trouble started with CLICO & CL Financial but only 14 days before the lawsuit was launched over the US$300 million dollar land deal. We find the timing highly curious and we’re sure that Bob Lindquist and the Plantiff Green Island Holdings, LLC will too! For full details, copies of corporate and court documents, visit BFP’s story EXCLUSIVE REPORT BY BARBADOS FREE PRESS: CL Financial Group Collapse – Insiders Took Bribes To Have Company Purchase Land For More Than Market Value!